It seems impossible that the concept of the Internet of Things came about decades ago. Things were associated with the network soon after its origins. It was always understood that networks were not only for people but also for the myriad of devices that people needed. Now that we made considerable computing power, portability and wireless connectivity innovations, the dream of the IoT is finally taking shape. Even with these hard won gains, achieving a viable design creates a challenge for engineers. Multiple barriers still remain, according to a recent report by Bain & Company. The remote nature of IoT devices means they must operate independently. Many IoT systems achieve vital roles in either gathering data such or providing access and control. But how many of these devices can you trust? How easily can an intruder hack physically or remotely into the system? What is the mechanism that isolates vulnerabilities so the entire network cannot be brought down in the case of a breach? There are not consistent industry-wide answers to these questions. As some microcontroller suppliers are developing secure boot loading implementations that can validate themselves, security standards are still not universal. 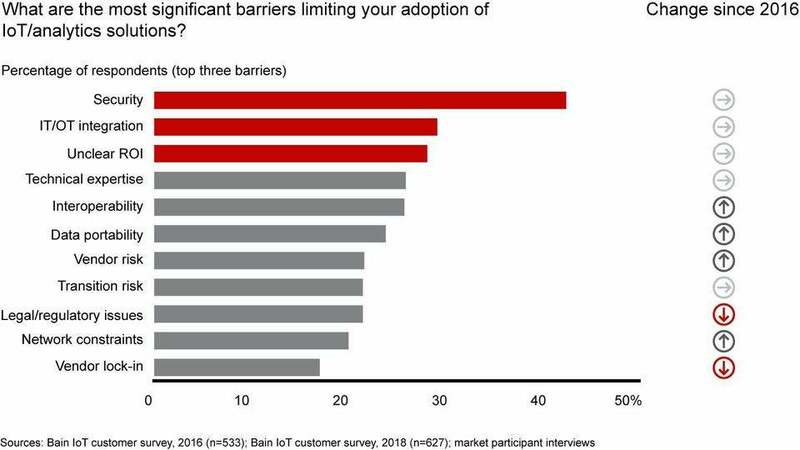 Not knowing whether an IoT system is trustworthy seems more paralyzing than having an IoT system, presenting the largest perceived barrier in the industry. Integration is all about the software used and the links available to carry data. 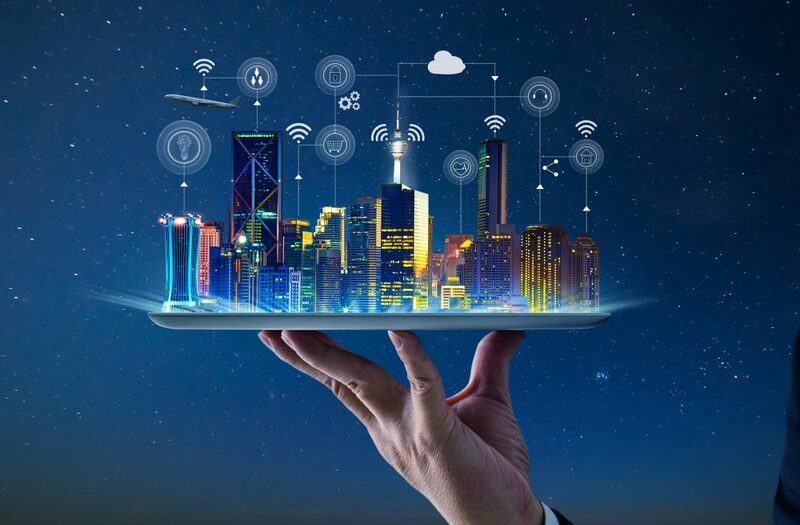 Connectivity solutions appear to be capable of scaling with the IoT, as LoRa, Sigfox, cellular, Wi-Fi, Bluetooth and Zigbee grow in popularity. Tying a small form factor IoT, with limits in computing power and focused on saving energy to the rest of the Internet and the cloud, may still present a real challenge. Many IoT systems require the development of complex API’s, software GUIs and even handheld apps. The complexity of this task may live beyond the technical expertise of many companies heading into IoT markets, which creates a large barrier. Both startups and large established companies operate on return on investment (ROI.) No decision goes into effect without a clear picture of profitability. New IoT business models, particularly in consumer markets, may not show a long-term return that validates the necessary investments required to enter those markets. With time these markets will become better understood but until then a barrier remains on the uncertainty of ROI. For an industry full of highly experienced engineers the IoT should be no sweat. However, this new industry brings a wide set of new challenges. IoT devices have many technical requirements in power consumption, connectivity and processing that their predecessors do not. For example, many IoT devices need to push battery power from days to months. Additionally, adoption of RF designs, such as narrow band radios and GPS receivers, may be new to many of these existing devices. Sneakers, power tools, remote sensors and home items that were never connected or powered in past designs must be upgraded for the IoT. Additional processing requirements add software and integration complexity to the mix. New disciplines within existing teams and new teams within existing companies must be developed before IoT designs become possible. Many engineers must rely on established and proven reference designs, such as NXP’s Rapid IoT Prototyping Kit, in order to shortcut time to market and overcome the technical challenges of new IoT designs. As additional reference designs develop, this barrier will lift. The IoT is here but still presents challenges. The barriers discussed above are being tackled by the entire industry in the form of RF and component validation solutions, ready-made highly integrated reference designs and low power advanced components technology. Each advancement brings us closer to a complete IoT future.